RAPAPORT... 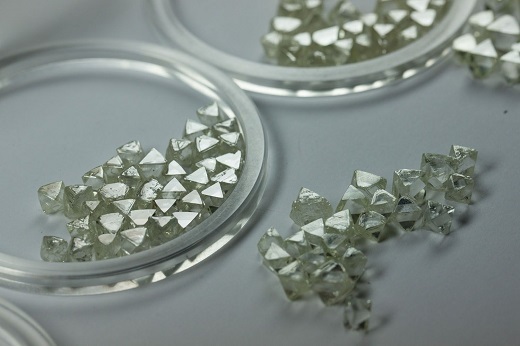 Sales of higher-quality stones and an increased average price drove a spike in Alrosa’s profit and revenue in 2018. Profit increased 15% to RUB 90.4 billion ($1.39 billion), while revenue climbed 9% to RUB 299.7 billion ($4.62 billion), the miner said last week. The company’s diamond sales jumped 12% to RUB 278 billion ($4.29 billion), despite a 12% decrease in sales volume to 26.4 million carats. The decline in carats sold was offset by a 21% surge in the average price for gem-quality diamonds to $164 per carat. Alrosa derived its remaining revenue from transportation, gas and social infrastructure. Belgium remained the miner’s biggest market, as sales increased 4% to RUB 130.39 billion ($2.01 billion). Domestic sales went up 8% to RUB 53.34 billion ($823 million) and India sales grew 3% to RUB 41.14 billion ($634.7 million). Production for the year fell 7% to 36.7 million carats, due to the shutdown of the Mir pipe and the completion of open-pit mining at the Udachnaya pipe, the company said. In the fourth quarter, revenue inched up 1% to RUB 61.4 billion ($947.4 million), as the average price rose 10% year on year to $153 per carat. Profit plunged 52% to RUB 7.9 billion ($121.9 million) as the figure in 2017 was higher due to a payout from an insurance claim, Alrosa noted. “The trend of weaker demand for lower-priced stones that emerged in the third quarter continued into the fourth quarter,” the company added. Alrosa’s diamond inventory decreased 6% year on year to 17 million carats as of December 31, as the miner sold more diamonds than it produced. The miner’s rough-diamond resources increased to 1.1 billion carats at July 1, from 1.03 billion carats the company reported in January 2017. Reserves, defined as resources whose mining is economically viable, dropped 4% to 628 million carats.